What was it that brought the naughty little Sunday School student full circle? How did he get into Time Magazine as one of the 20th century's most influential people? Why was 'Uncle John' listened to by many, read by thousands and recognised across the world as a pastor, friend and leader? 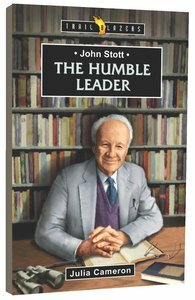 About "John Stott - the Humble Leader (Trail Blazers Series)"
Julia Cameron is Director of Publishing for The Lausanne Movement. She lives in Oxford.